James Corden (Into The Woods, Trolls) stars as the beloved rebellious rabbit in the contemporary feature film adaptation PETER RABBIT ™ out now from Sony Pictures Home Entertainment. In addition, the physical skus will also include digital versions of the movie, redeemable via the all-new Movies Anywhere App. Experience all the mischief in McGregor’s garden with Corden voicing Peter Rabbit, Margot Robbie (I, Tonya, Suicide Squad) as Flopsy, Elizabeth Debicki (The Great Gatsby, Guardians of the Galaxy: Vol. 2) as Mopsy, and Daisy Ridley (Star Wars: The Last Jedi) as Cotton-tail. Rose Byrne (Bridesmaids, Spy) and Domhnall Gleeson (Star Wars: The Last Jedi, Ex Machina) also star as Bea and Mr. McGregor. This movie is entertaining and full of laughs from the beginning. Something the entire family will enjoy! 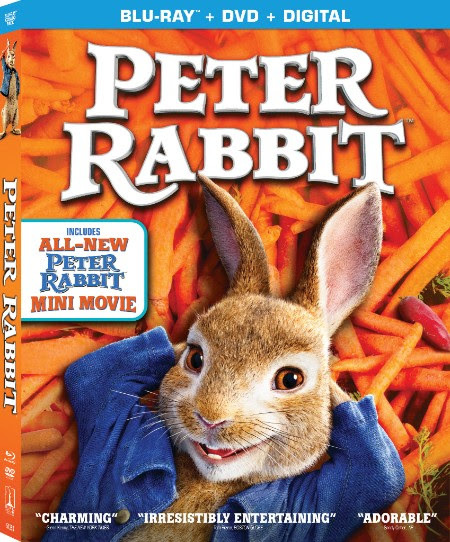 We watched it for family movie night recently and fell in love with Peter, his family and friends! It is a cute story about family and friendships, even though Peter and his crew can get mischievous and cause damage, he know when he makes a mistake and doesn't have a problem admitting when he is wrong. It is a great lesson for kids and adults alike.